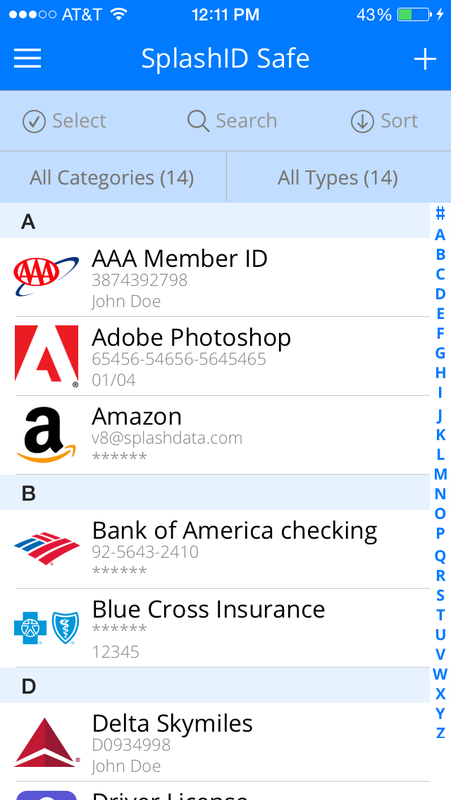 SplashID provides quick and easy access to all of your personal identification information, including usernames, passwords, credit cards, PINs, calling card numbers, frequent flyer numbers, insurance info and more. Data is stored in a secure, encrypted, password protected format and can be synchronized between SplashID on your mobile device and SplashID on the desktop (Windows, Mac OS, and web). You may prefer to do most of your data entry on the desktop, however, since it's faster and easier with a keyboard, and then synchronize the data with your mobile. In addition to automatic sync, the optional SplashID Cloud Services also include a new web-based version of SplashID, in-app support, and access to a full suite of identity protection services with experts available on demand by phone. This is the familiar Wi-Fi sync solution that has been in SplashID since version 4. Manually connect the handheld and desktop apps over your local Wi-Fi network. This option exists for those users who don't plan on synchronizing their SplashID data. Your data will exist only in the local database on the device, and will not be automatically backed up or synchronized with any desktop or web app. The record list is your main view for SplashID. From here you will browse, search, add, edit, and view records. Swipe any record to the left and tap More to take record actions such as Web Login, Edit, View, and Delete. Side menu button (three lines) - View account and license info, go to main view (record list view), access Dashboard, Backup, Settings, Edit Categories, Edit Types and Help, or lock the app. When you tap on a record in the Record List, it opens the Record Details screen. We've designed this screen to give you everything you need on one level so you don't have to drill down to make changes. Tap any field to access tools, such as Edit, Copy, Generate (password), and Mask. You can set password generator settings in the main Settings screen. If you want to add additional fields, tap an existing field, then tap Edit, then you can enter data on the extra fields or add an attachment (up to 1 attachment per record, and 1 MB max per file attachment). Tap the Login button next to field 1 if the record is a Web Login to open the web browser and autofill the username and password. You can also turn on Auto-Submit in Settings. Make Local will designate any record in your SplashID database as Local only. This means the record stays local on the mobile device and does not sync to the cloud server. If the record is already on the web app or on any other devices running SplashID, it will get deleted from those apps. At any point, you can set the record back to sync with the cloud. The record would then sync back to the cloud server and appear on all devices. Duplicate will make a copy of the current record so you can edit it and save it as a new record. Share will send the record as a secure file for SplashID users or a limited use self-destructing web page for non-SplashID users. Delete will delete the current record. While viewing a record, tap a field and then the Edit button to make changes. This is also what you see when you tap the New Record button from the Record List. We've designed this screen to give you everything you need on one level so you don't have to drill down to make changes. Tap the Category or Type menus to change the record's assigned category or type. Tap the Icon to access the icon picker and make a new selection. This may not be necessary, however, as many logos are automatically assigned after you enter the record name. For example, type "Amazon" for the record name and the Amazon logo shows up when go to the next field or save. You can also add custom icons, if the built-in ones are not sufficient. Tap the field in the data space or the field label to edit them directly. Tap the Notes field to add notes up to 4000 characters. Tap the Add Attachment button to add a photo or document (1 file per record, up to 1 MB per file). Note: Only Categories and Types that contain records are displayed in the filter menus on the Record List screen. So if you create a new Category/Type, it will not show up in the filter list until you create a new record and select the new Category/Type, and save the record. SplashID Safe -- This is the Record List, where you can search, view, and edit your secure records. Dashboard -- Access the Dashboard, where you can analyze your records and improve your security. 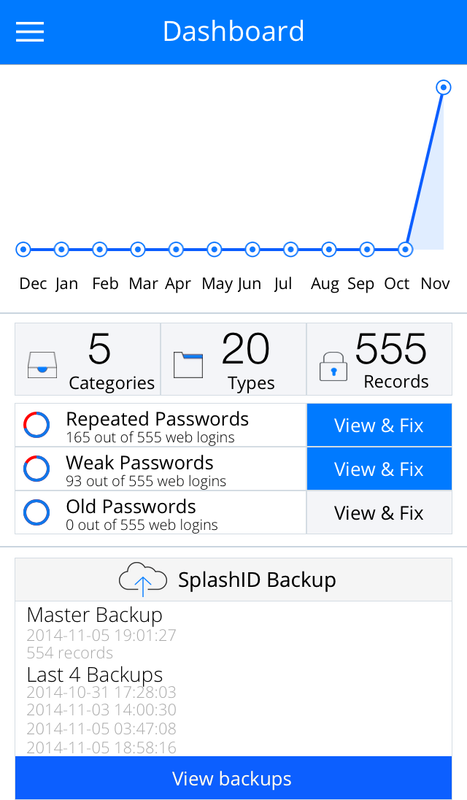 SplashID Backup -- Cloud sync users will be able to access and restore online backups on those rainy days. Settings -- Access all the SplashID Settings. See the next section for details. Edit Categories -- Displays the Categories which you may edit, add or delete. 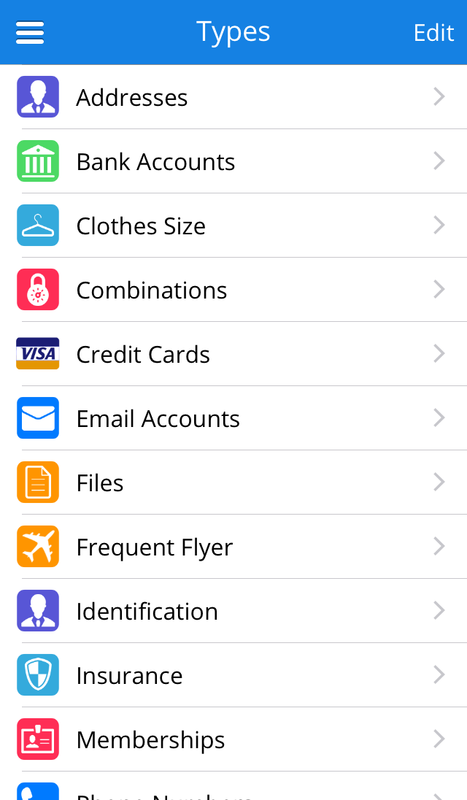 Select an existing Category to edit its name, or tap Edit buton, then Add Category to add a new one. Edit Types -- Displays the Types which you may edit, add or delete. Select an existing Type to edit, or tap Edit, then Add Type to add a new one. Get Help -- Access the SplashData Help Desk at support.splashdata.com. Lock Now -- Locks the app and encrypts the SplashID database. Email -- This email address needs to be valid and the same on every version of SplashID you use. Log out -- Allows you to log out, so you can relogin or login to another SplashID account. Please note this loses (deletes) all local data. Change Email -- Select to edit the email address you associate wit your SplashID account. Change Password -- Select to edit the password protecting SplashID. See Security for more info. Account Summary & Sync Method -- View your account status and switch to a different sync solution. Sync Troubleshooting -- In case of Cloud sync issues, allows you to Download All records from Cloud (replacing all local data with the data in Cloud) or Upload all records to Cloud (in case local data is full and correct and Cloud data is not). Offline mode -- Allows you to stop the mobile app from any communication with our Cloud servers (requires at least 8.0.10 version of the app). Only available in WiFi Sync and No Sync modes. Doing any action that requires server communication such as changing your password will warn you a server connection will be made. Login Lock Sound -- Turns on or off the click sound that is played at login or locking. Set Timeout -- Change your auto-locking timeout period: from Immediately to up to 30 minutes. Password Generator -- Change settings for password generator - length and included characters. Enable Touch ID -- If you have Touch ID enabled on your device, turning on this option will alow you to unlock SplashID using Touch ID. Please note that you must already have Touch ID enabled on your iOS device, with at least one fingerprint stored. This is set up in the System Settings > Touch ID & Passcode. 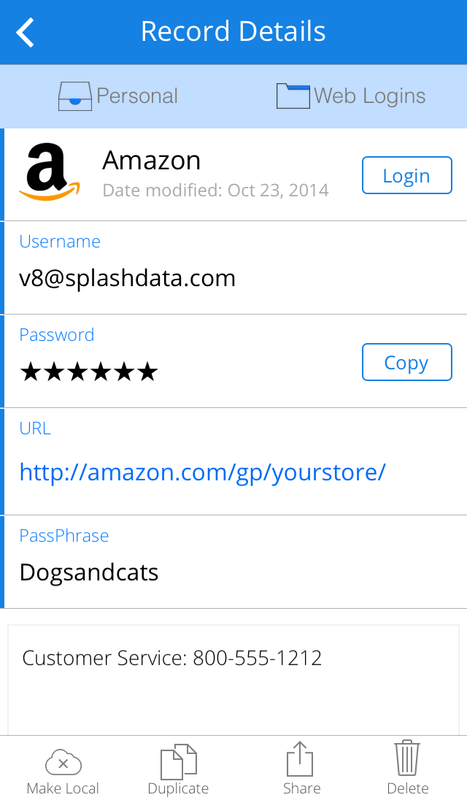 Touch ID login will be requested when you launch the SplashID Safe iOS app after the timeout period has been reached. The default is 1 minute, but you can adjust this in SplashID settings. Store SplashID password in iOS Keychain - with this option you can use Touch ID log into SplashID anytime, even after force quit. This access is enabled by storing your SplashID password securely in the iOS Keychain. This item in iOS Keychain is not synched to other devices or backed up to iTunes or iCloud. Do not store SplashID password in iOS Keychain - with this option Touch ID is enabled with SplashID, but if you force quit the app or restart your device, you will be required to log into SplashID using your SplashID password. Display Credentials -- When web logins are autofilled, the username and password are displayed at the top of the screen. Delete Records -- Displays a list of all records, allowing you to select multiple (or all) records for deletion. DeDupe -- Use this tool to search for duplicate records and then delete them. Dynamic Search -- With Dynamic Search ON, the Find tool will start filtering search results as you type. When OFF, you must tap Search when you are done entering the search terms. Send Records -- Use this tool to send records in a vID file format to anyone. The vID file with selected records will be sent as an attachment over email. Share Securely-- Use this tool to send multiple records or all of them as a secure file for SplashID users or a limited use self-destructing web page for non-SplashID users. Received records -- Here you will find records that other users have Shared Securely with you. Export SplashID vID to Dropbox -- If you have the Dropbox app installed, you can export a backup of all your records to a secure vID file (protected by your master password) to your Dropbox folder under Apps/SplashID/. Please note file attachments (if any) are not exported. About SplashID -- Displays the version/build info. User Guide -- This guide. FAQs -- Web View of the online Frequently Asked Questions. Send Feedback -- This tool is intended to be used to make suggestions or feature requests. You may not get a reply to this email, so if you need technical support, please submit a ticket. Remember this password. You will need to use this same password to open SplashID on all platforms. Setting a Pattern -- A more fun and convenient way to login is using a pattern. To set a pattern, tap the Pattern button in the Set Password dialog. Then draw your pattern using the numbered dots supplied (no overlapping or repeating). Tap Continue and confirm the pattern, then make a note of the numeric equivalent - this must match the SplashID desktop if you plan on synchronizing. In version 6 of SplashID desktop, you can use a pattern to login as well. Please note you can not use both a pattern and text password, it is always one or the other. Changing a Password -- To change a password, select Set Password from the Tools menu, enter your Old Password, then enter and confirm the New Password. 2-Factor Authentication -- 2-factor Authentication is a recommended option to increase the security of your SplashID account. The 2nd factor is an additional code that needs to be entered when your SplashID account is accessed from a new desktop, device or browser. One you confirm access is authorized with the additional code, you will no longer need to enter the 2nd factor code when you log in from that device or browser. This works only for Cloud Sync users. 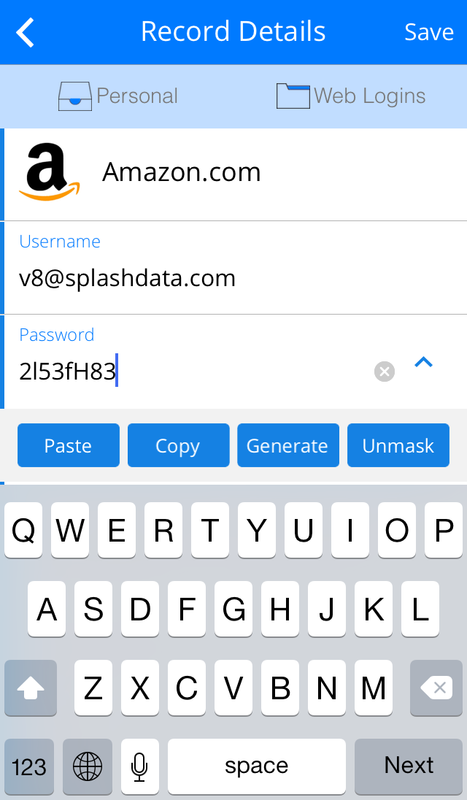 To use 2-Factor Authentication, login to your SplashID account using the web client. Under Settings > 2-factor authentication, select 'Enable 2-Factor Authentication' and click on Save. Once enabled, if you attempt to log in to your SplashID account from a new browser, desktop, tablet or phone, you will be required to enter a 6-digit code which is emailed to your SplashID account email or sent to your phone number via SMS. Once you enter the second factor code, you should never be asked for the code again on that browser or device. If you want to authorize access on a another new browser or device, you will need another second factor authorization code sent. Share Multiple Records -- When in the List View, tap the Select button on the top toolbar, and then choose records you wish to share. Then tap the Share button on the bottom toolbar. Share Single Record -- When viewing the Record Info, tap the Share button on the bottom toolbar. Then you have the option to share via AirDrop (to other iOS devices only at this time) or Share Securely (which works with both SplashID and non-SplashID users). The SplashID cloud syncing service that seamlessly updates any changes to your records when you launch the application. No more fussing with Wi-Fi sync (unless you want to). Here's the great thing about it - we don't have to explain how to use it. Just login to your various SplashID versions (iPhone, iPad, Mac, Windows, Android, Windows 8, Windows Phone, BlackBerry 10, and web app!) with the same email address, and your data synchronizes automatically. Never is it out of sync, never do you have to worry about loss of data or backing up. It just works. Items may be created or edited on the Handheld or Desktop and the changes can be synchronized over your local Wi-Fi network. You can download the SplashID desktop for Mac or Windows from splashid.com. With SplashID 8, cloud sync users have a new backup service that protects them from data loss forever. Every week, a new encrypted backup is automatically created for you. Your 5 most recent backups are available anytime to download or restore as your current database. And you can lock in any backup (or your current database) as your master backup. Hopefully you'll never need to use it, but if you do, here's how. You can also make your current database the "master" backup by clicking the check mark in the first control. 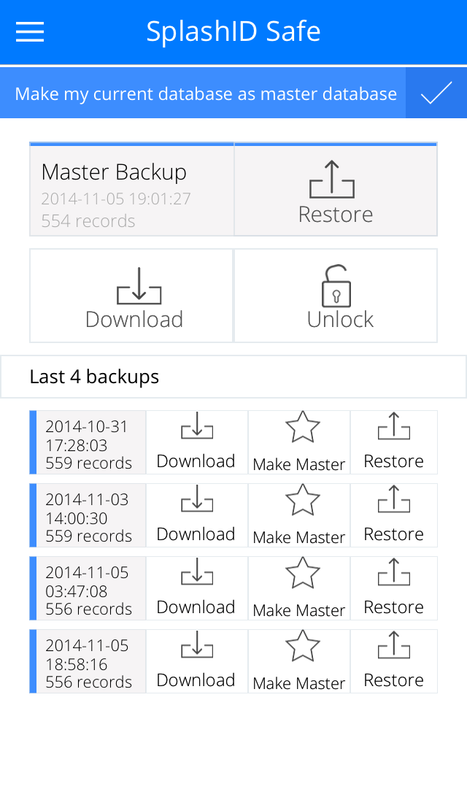 The master never gets overwritten by newer backups, giving you a reliable restore point once you set it. If you want to release the master backup, click the Unlock button. Or you can just replace the current master backup with your current database at any time using the first control again. Use the Export SplashID vID to Dropbox feature found in the Settings screen. Email yourself a backup VID file of your iOS records. This is done using the Sharing Records feature. Use the SplashID Desktop app for Mac OS or Windows. There is an auto-backup feature in these apps that stores up to 5 incremental backups locally on your computer. Connect your device to your computer and back it up via iTunes. Enable iCloud backup on your device, and make sure SplashID is included in the list of app databases to be backed up. It seems like every day you hear about a new hacking incident or data breach, and you know you should be combing through your SplashID records, changing your old or weak passwords, and of course making sure you're not using the same passwords on multiple sites. That's what you should be doing, but the task is too often put off since it can be time-consuming and overwhelming. That's where our new dashboard comes in, constantly analyzing your SplashID records to identify old, weak, and reused passwords and enabling you to fix them with just a few clicks! The graph shows you the overall growth of your SplashID database over time, and under that you will find a table indicating the total number of categories, types, and records in your database. Below that you will find an analysis of how many of your passwords are Repeated, Weak, or Old. The progress indicator to the left shows how much of your database contains these weaknesses (in red). Tap the View and Fix button to access a list of the records that contain these weaknesses. The idea is that you take on one of these weak records, generate a stronger password in SplashID while login into the website and updating your password with the service. 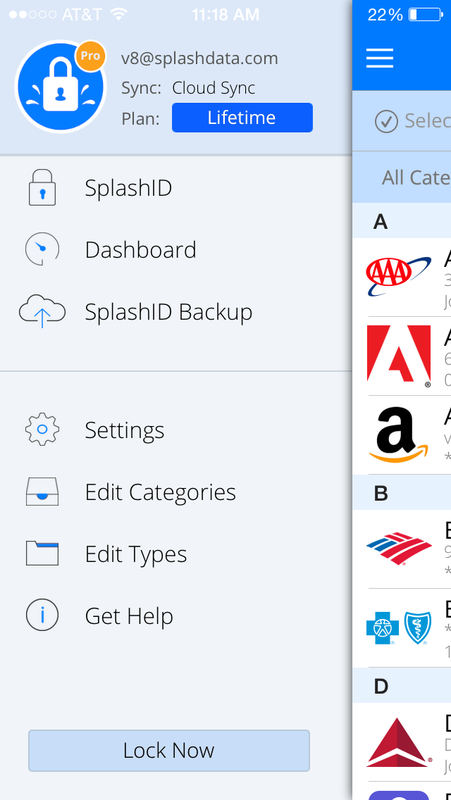 At the bottom of the Dashboard screen is a handy shortcut to the SplashID Backup feature.